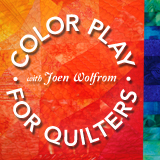 Quilt Artist Joen from Seattle, has produced a really good resource book which takes away the worry of designing your quilts. By learning to draw patterns you gain freedom to create whatever quilt block you wish — in the exact size you want. The good part is that there is no complicated mathematical formula to learn and no calculators to use! With this book you will be able to draw blocks from all the basic “patch families” – 4, 5, 7, and 9 patch. You go on to blend blocks to form new exciting designs, there are more than 60 traditional blocks to stimulate you and dozens of beautiful quilts to inspire you. Good instructions and wonderful colour illustrations make this book a delight. Sometimes you choose a pattern and want to make a larger or smaller size block. Do you know how to to handle making those size changes? Joe n Wolfrom shares her “flexible grid” method in Make Any Block Any Size. Joen swears you don’t need math or a calculator to change the size of a block, How can that be? She uses the century-old grid method. I can’t explain it in a paragraph, but essentially you will learn to draw a square in any size you choose and divide it into a grid. The grid varies depending on the type block you choose to make—four, divisions for Four-Patch blocks, five divisions for blocks divided into five equal parts, and so on. It doesn’t matter if you are making a 6, 7, or any size block, once you have drawn the square in that size and divided it into an equal gird, you can make almost any design. Most books, magazines, and purchased patterns choose blocks in the most common sizes— 6”, 12”, 16”, etc. What if you want a block 7 ¼” in a design and the pattern you choose is in a different size? Here is where the grid method will help you out. If you have been frustrated in the past with your ability to draft patterns, maybe you would benefit from learning Joen’s flexible grid method. Discovering that you can control the size of any block design might unleash the new quiltmaking opportunities for you. A book for traditional block fans who would like to either chdesign their own or to dispense with the restriction of working from blocks and templates published in a particular size. Joen starts by describing a very simple and not generally taught technique for enlarging blocks shown to her by her architect brother. She sees blocks as families of grids: 4-patch, 9-patch etc., and illustrates how to dissect block designs so that they can’t be enlarged.